What does ten-e and zuise mean? Ten-e literally means “to turn the robe”, i.e. to change dress. 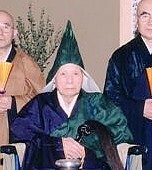 Unsui (training monks) are allowed to wear only black robes and black o-kesa. When you ordain, your teacher has to send a picture taken at the ceremony to the headquarters in Tokyo to have the ordination certified. In the past I gave some of the monks who ordained at Antaiji brown kesas at ordination, and as a result the were not recognized as Soto monks. This is strange, because o-kesa stems from the Sanskrit word kasaya, which obviously refers to the mixed, rusty-brown colour the monks robes are traditionally dyed in. Anyway, I had to take another picture with my students in a different, black robe, and voila!, they were recognized as proper Soto monks. Now, ten-e is the point in the carrier of a Soto monk when you are finally allowed to wear a yellow-brown robe. The conditions are that you have finished dharma transmission (shiho) and are at least 20 years old. You had to be at least 16 to become a head monk (shuso), and in theory you could receive dharma transmission as a teenager. But you are not allowed to wear the brown robe before the age of 20. This is interesting, because at the time of the Buddha – and even now in the Theravada tradition – you have to be at least 20 years old to take full ordination as a bikkhu (monk). 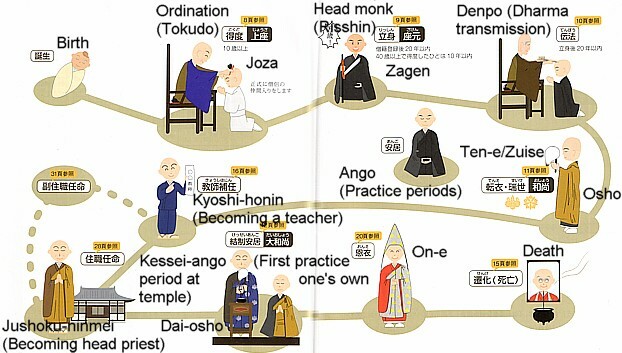 Could it be that ten-e in Soto-shu is something like a full monk’s ordination? At least in theory, the answer is no. The precepts for novices, in Japanese shami-kai exist also in Soto-shu, but they are only given to kids below the age of 10. If you ordain and are over 10 years old, you are – at least in theory – a full fledged monk. But in practice, I think, the regular tokudo-shiki (monk’s ordination, also called priest’s odrination sometimes) is something like a novice ordination, while the steps of dharma transmission, ten-e and zuise finally make you a proper monk. But that is only my personal impression, it is not the official Soto-shu point of view. If you are over 20 years old, you can do ten-e any time after you have finished shiho. Your teacher has to send in a document called ten-e-suikyojo. If your teacher has already died, you can send in a document by yourself called ten-e-shiganjo. After a little waiting, the headquarters will return a document called ten-e-kyojo, i.e. the permission to change the robes and wear a coloured o-kesa. After receiving this permission, you have two years of time to pay respect to the two main temples, Eiheiji and Sojiji, where you act as the “abbot for one night”. This is called zuise and this is the first time you wear the yellow-brown o-kesa. If you do not perform zuise within two years after ten-e, you lose the permission to change the robes, i.e. you have apply a second time. There are regulations for ten-e after your teacher has died. Are there regulations for shiho in the case your teacher dies? Naturally, you can not receive shiho from your teacher after he has passed away. Dharma transmission in a dream is not recognized. How abot dharma transmission on the deathbed? In fact, this kind of dharma transmissonm can be recognized, but only under certain conditons: If the teacher lies on the deathbed, he or she can transmit the dharma without the usually decorum and the one-week preparation of documents, but with a simple prostration of teacher and student (called shi-shi-menju-no-hai in Japanese). Still, witnesses are necessary. it is not enough to claim that your teacher whispered the words into your ear, unheard by anyone else. The witness needs to be a Soto-shu priest who is on the board of the temple (i.e. the sekinin-yakuin) and at the same time a doctor needs to issue a medical certificate as proof of the critical condition of the teacher at the time of the shi-shi-menju-no-hai. Even in this case, there are objective criteria for dharma transmission to take place. It never happens just “mind-to-mind”. After ordination, you are a joza. After being the shuso for a three-month training period, you become zagen. After finishing zuise, you are promoted to osho. These four ranks are pretty straight forward and depend on nothing but your performance as a monk under your teacher, and then as a head priest. These ranks are called hokai in Japanese, which literally means “dharma ranks.” Apart from these “dharma ranks”, there exist eight special ranks, sokai in Japanese, which means “priest rank”. 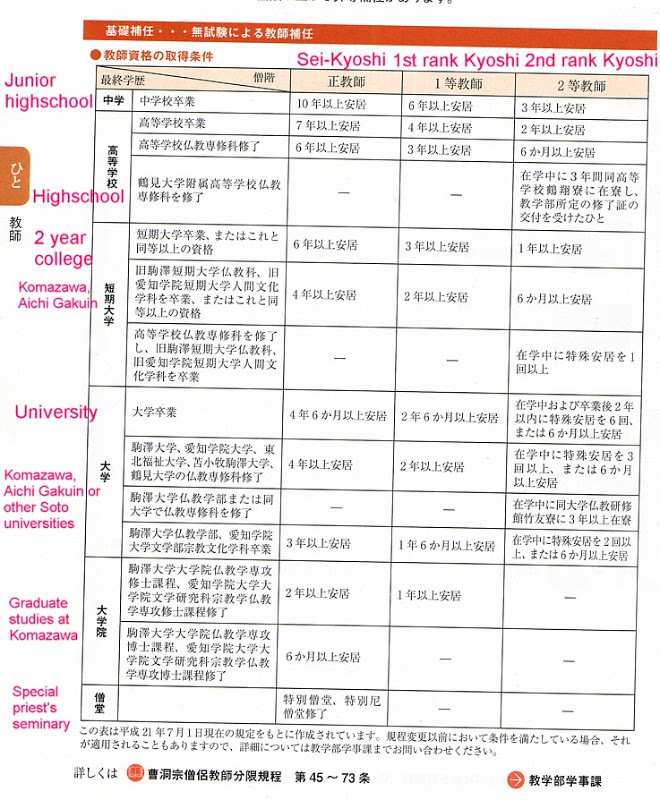 Promotion from sokai to sokai is a little more complicated and depends on the school education you received and the amount of time you spend in an offivially recognized training monastery. The lowest sokai is that of a third rank priest. I do not know anyone who has that rank, it does not entitle you to become a priest. When you ordain, you do not have a sokai at all. You get promoted after you trained in an officially recognized monastery and then complete zuise. Everyone I know gets promoted at least to the 2nd rank priest, which is the second lowest rank. 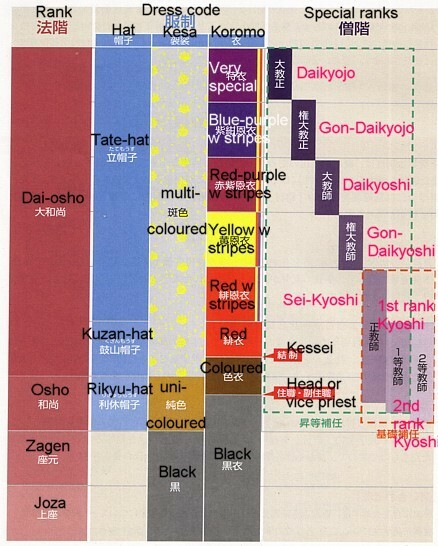 The list below shows how long you have to stay in a training monastery to be promoted to the rank of 2nd rank, 1st rank or sei-kyoshi. As a simple training monk, you pay nothing. As 3rd rank kyoshi, you pay 4.000 Yen (about 35 bucks with the strong Yen of 2010). As 2nd rank kyoshi, you pay 10.000 Yen. As 1st rank kyoshi, you pay 15.000 Yen. As sei-kyoshi, you pay 30.000 Yen. As gon-daikyoshi, you pay 150.000 Yen. 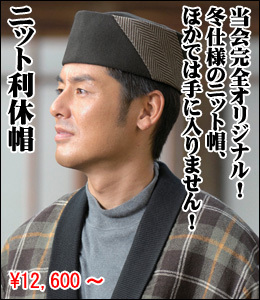 As daikyoshi, you pay 210.000 Yen. As gon-daikyojo, you pay 300.000 Yen (about 2700 bucks in 2010). No-one knows, if or how much the daikyojos pay. You have to make these annual contribution through the temple at which you are registered until you die. After your death, the temple has to produce a deat certificate to be exempted from these contributions (this can become important, as Antaiji for example has to pay contributions for a nun (1st rank) that ordained with Sawaki roshi more than half a century ago and hasn’t been heard of for decades. Still we are billed for her contributions every year, and that hurts if you have no parish and therefore no income from funerals). OK. So much for whining about the bureaucratic stuff. Some words about the “officially recognized training monasteries”. These are called sodo in Japanese, literally a monk’s hall. Antaiji consideres itself a sodo, but we are not an officially recognized one. That means that you can train here for as many years as you like, you will not be promoted to any rank (except osho, if you receive the dharma transmission – about which we learned two months ago). If you want to become a full-fledged priest who can take over a Soto temple in Japan, you have to spent at least a couple of months to a couple of years in one of thirty something training monasteries in Japan. The most famous ones are Eiheiji and Sojiji, but from Hokkaido to Kyushu, there many other alternatives. Eiheiji and Sojiji have more than 100 traing monks staying there (usually for not more than a year or two), while most of the others have less than ten monks living in the monastery. All of them except two are for men, the nunneries are in Nagoya and in Niigata prefecture. The time done in these places is called ango, it will be the topic of another article. But in two months, first let us get back to zuise, becoming the head abbot of Eiheiji and Sojiji for a night.